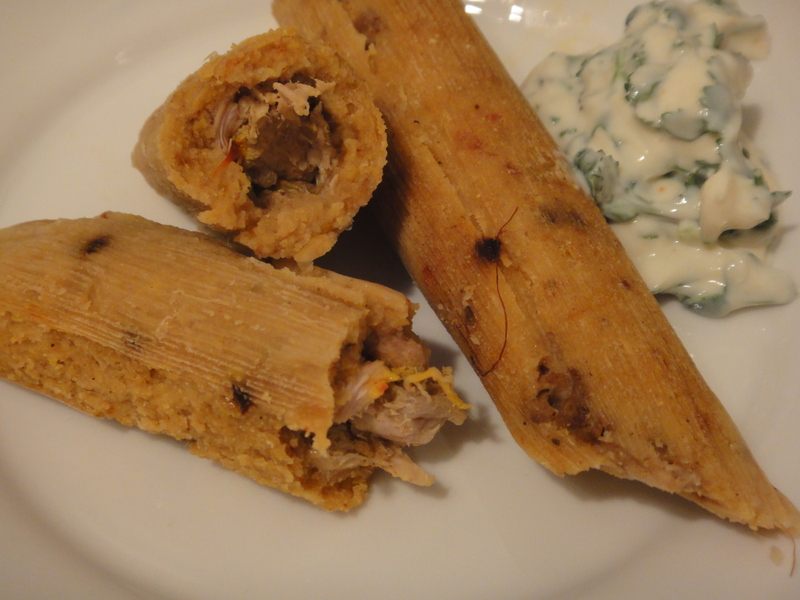 After my tamale experience a few months ago, I was pretty eager to try out some more recipes for tamales. I had learned a couple lessons from the last time (like kitchen twine instead of corn husk ties and spreading the masa thin) and was rip-rearing to go! Don’t get me wrong, the last recipe was really good – I just wanted to try MORE! These were really yummy and used a different cooking technique from my first batch…jury is still out on which method I thought was most effective. Both methods were easy for sure, I’m just not sure which one yielded the best results. I do know that I definitely scorched a dish towel with this cooking method. Whoops! I really like this recipe for the masa better than the first one (MUCH more flavor) and think that I’m going to make this one my standard and just experiment with fillings and toppings going forward (Branden really thinks I need to come up with a sauce to pour over them – the way they’re served in many Mexican restaurants). Combine chicken broth and ancho chiles in a microwave-safe bowl. Microwave at HIGH for 2 minutes or until chiles are tender; cool slightly, Combine broth mixture and corn in a blender; process until smooth. Lightly spoon masa harina into dry measuring cups; level with a knife. Combine masa harina, salt, and baking powder, stirring well with a whisk. Cut in lard with a pastry blender or two knives until mixture resembles coarse meal. Add broth mixture to masa mixture; stir until a soft dough forms. Cover and chill until ready to use. Place corn husks in a large bowl; cover with water. Weight husks down with a can; soak 30 minutes. Drain husks. To prepare filling, heat a large nonstick skillet over medium-high heat. Coat pan with cooking spray. Add sausage to pan; sauté 2 minutes or until browned. Add onion; sauté 2 minutes. Add garlic; sauté 1 minute, stirring frequently. Stir in broth and saffron; bring to a boil. Reduce heat, and simmer 2 minutes. Stir in chicken; remove from heat. Working with one husk at a time, place about 3 tablespoons Basic Masa Dough in the center of husk about 1/2 inch from top of husk; press dough into a 4-inch-long by 3-inch-wide rectangle. Spoon about 2 heaping tablespoona chicken mixture down one side of dough. Using the corn husk as your guide, fold husk over tamale, being sure to cover filling with dough; fold over 1 more time. Fold bottom end of husk under. Place tamale, seam side down, on the rack of a broiler pan lined with a damp towel. Repeat procedure with remaining husks, Basic Masa Dough, and filling. Cover filled tamales with another damp towel. Pour 2 cups hot water in the bottom of a broiler pan; top with prepared rack. Steam tamales at 450° for 55 minutes, adding water as necessary to maintain a depth of about 1/2 inch. Let tamales stand 10 minutes. To prepare cream, combine sour cream and remaining ingredients, stirring well. Serve with tamales. I love seeing all the Mexican recipes you post. This looks smashing.